“Give me a LEVR strong enough and I’ll move the world.” is the saying. Well, close enough. 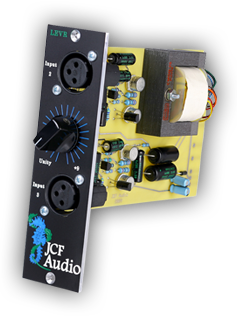 The JCF Audio – LEVR is an active summing module for the popular 500 Series format and by drawing from the discrete playbook it expands greatly on the language audio summing. The LEVR offers an affordable, active, non-exclusive alternative to passive summing users which other solutions do not. Due to it’s elegant design and low parts count, the LEVR will bring unparalleled musicality and resolution to your bus. the stability of single element inputs. Power Supply And Connector +/- 16v +/-20ma.